A couple that was injured when their vehicle was pushed into a concrete barrier by a semi truck retained Davis Law Group represent them in possible legal action related to the crash. In November 2017 the couple was traveling eastbound on Interstate 90 near exit 60. As the couple passed a semi truck owned by Triple D Supply in their 2004 Nissan Titan the tractor trailer suddenly attempted to switch lanes and forced the Nissan into the concrete barrier. The couple suffered injuries that included fractures and ultimately required surgery. 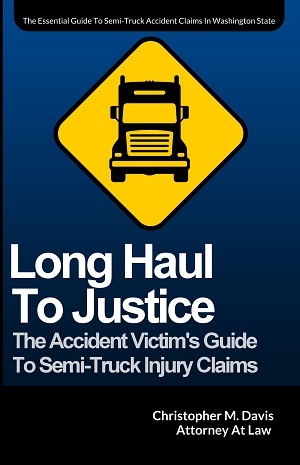 CALL FOR WITNESSES: The truck accident lawyers at Davis Law Group are also looking into the circumstances which caused this collision. Attorney Chris Davis is asking that any persons who saw this incident; who may have come upon the scene after the crash; took photos/video; anyone who may have tried to offer assistance on the scene or who had any contact with any of the victims; or anyone who has any information about the accident to please call Davis Law Group at 206-727-4000.